“Bumpy” package generates most-ever leads for 800 service! 800 Direct needed to get its message into the hands of key telemarketing managers and marketing directors of companies nationwide. These individuals are extremely busy, hard-to-reach, and inundated with promotional materials. In order to bypass front office personnel and reach decision makers, this piece had to have a high perceived value that would trigger response. Craig Huey and his staff created a “bumpy” package with an attention-getting envelope featuring a humorous cartoon showing an incompetent telemarketing operator. The envelope asked the provocative question,“Who’s really answering your in-bound calls?” It also teased the reader with the promise of “Telemarketing Innovations” and a FREE checklist of 8 Costly Telemarketing Blunders. 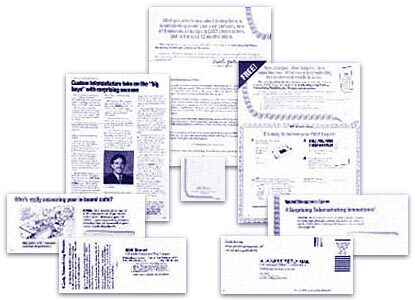 Inside, the letter took an informational marketing approach that explained the innovations, all fully detailed in a FREE Special Report, 44 Cost-Cutting, Profit-Making Telemarketing Breakthroughs, Strategies and Innovations“. An enclosed rolodex card and note pad created a “bumpy” package and also added value. Said Matt Epstein, Director of Marketing: “Thanks to your creative direct marketing promotion, we have never had so many leads. We can now begin establishing a relationship with these prospects and, hopefully, convert them to new clients in the near future! This piece was so successful it garnered both the Target Marketing Best of Direct Marketing Award and the West Award of Merit.